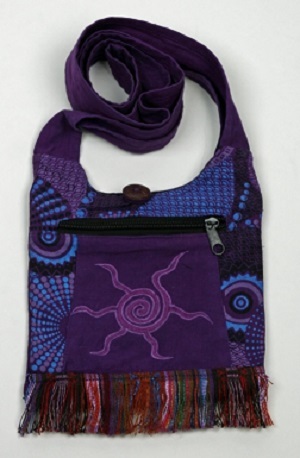 This bag features an embroidered sun design with a fringe bottom. It has an outside zipper pocket and a top opening with a zipper and button for extra security. This bag measures approximately 8" x 8" and has a cross body length strap approximately 38" long. Available in 3 different color schemes.